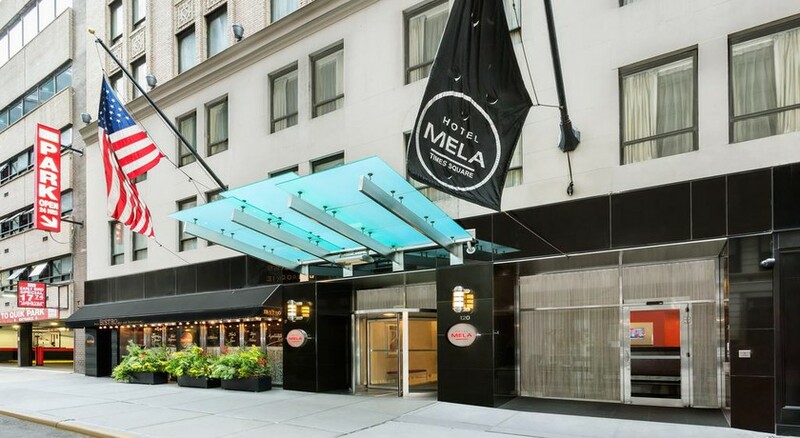 Hotel Mela, is a lovely boutique hotel located in Midtown Manhattan, just steps from the bustling Times Square. 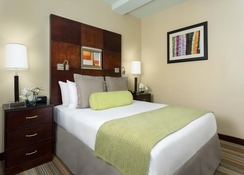 Guests will feel welcomed at its warm, Italian-inspired décor and furnished airy guestrooms offering all modern amenities. Offering two onsite restaurants the Long Room, a gastro pub and the cosy Saju Bistro serving breakfast, lunch and dinner, the hotel is well-suited to cater to guests after a busy day out. With 234 contemporary rooms and suites, the hotel aspires to make guests feel at home with its warm hospitality. 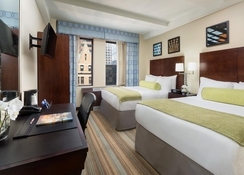 The hotel boasts of an enviable location in the heart of Manhattan with popular shopping destination Fifth Avenue or the cultural hub of Broadway minutes’ away. 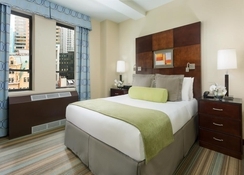 Hotel Mela is located in Midtown Manhattan just 450m from Times Square and 500m from Madame Tussauds. The Empire State Building is 1.3km. The Radio City Music Hall and Rockefeller Centre are both less than 1km from the hotel. The property is about 25km from the JFK International Airport. 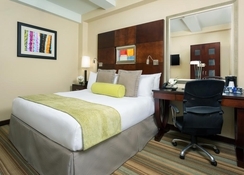 All 234 well-appointed rooms and suites at the Hotel Mela are non-smoking and feature luxurious bedding & mattresses, a flat-screen TV, safe, tea/coffee maker, work desk, safe, iron, hairdryer, bathrobes and complimentary toiletries. 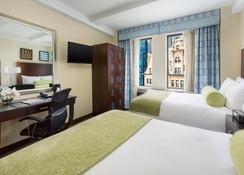 The rooms are designed with aesthetics and needs of the guests in mind and offer excellent views of the Manhattan neighbourhood. It is an advantage for guests bring their pets and guests can ask at the reception to have their pet essentials ready in room when they arrive. Rooms come in categories like Superior Full, Superior Queen, Deluxe Double, Executive Queen, Executive King, Executive Queen ADA, One BR Suite, Family Suite and Penthouse Suite. Hotel Mela has two onsite restaurants where guests can sample authentic NYC and continental. The Saju Bistro serves fine French cuisine for breakfast, lunch and dinner. The Long Room is a relaxed Irish gastropub serving craft beers, and international or domestic alcoholic drinks. Their $1 Oyster all day special is a must try. The pub has live music nights on Saturday. Guests could also try out the impressive array of restaurants in the neighbourhood or enjoy a meal in their room with room service. Guests at Hotel Mela have a fitness centre to work out during their stay. There is a helpful concierge service to assist them during their stay. The Long Room is a lovely place to relax with a drink. The neighbourhood is full of shopping attractions like Apple, H&M, Prada, Nike and Tiffany & Co on Fifth Avenue and the lights of Times Square and Broadway invite the guests to have a fun-filled evening by just stepping out of the lobby. Guests may ask for the Bloomingdale’s package for shoppers at the reception.